A breakout throughout old resistance of S&P 500 at 2135 is bullish. As such, we are legging into the markets a bit more. But our discipline is to always hold some cash over the summer, no matter how bullish the profile of the charts appear. 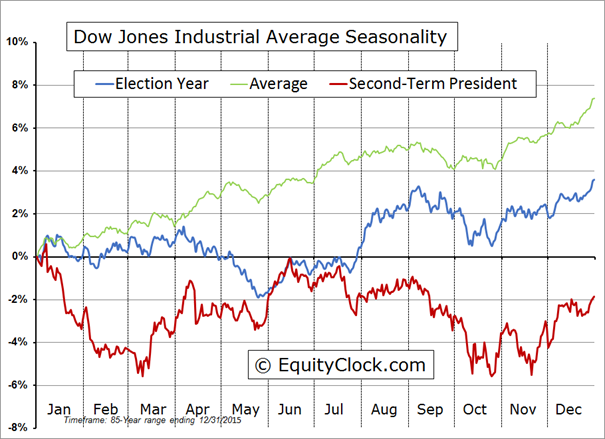 Seasonality show that the greatest period of volatility for markets is from late July through to October. The end of a second term president’s run can also add to potential downside. The chart below courtesy of equity clock , illustrates the standard presidential cycle vs. the second term presidential cycle. You will note that the potential for loss is greater during a second term election. This year could be particularly volatile given the candidacy of Trump, who is not considered to be a traditional Republican. Take a look at the CBOE put/call ratio below. I’ve noted that when the put/call ratio gets to about 0.76 (that is, about 0.76 puts traded for every one call), market players are too optimistic about the future. Further, the defensive sectors such as utilities, bonds and gold are moving higher – a sign of mixed investor confidence. I noted this last week on this blog. VIX is back down to my often noted low point of near 12. When the VIX gets around 12, it has been an accurate indicator of too much investor complacency – and that typically leads into a selloff. Also, New high/New low (chart below) and % stocks over 50 day MA’s (not shown) are well above the usual “overbought” levels. On the positive side, one of my favorite sentiment indicators – Smart Money/ Dumb Money (chart not shown) is not showing signs of Dumb Money (retail investors) skewed buying. Confidence is relatively equal between the two groups. All in, we decided to add a little to our equity via an energy position that we had a buy price reached yesterday. Other than that, we are keeping some powder dry to see how things play out for the next month or two. Tomorrow at 6:00pm, BNN has asked me to team up with my Associate, Craig Aucoin on a special MarketCall episode. Craig is the resident Fundamental Analyst here at ValueTrend. Viewers of this special show will have the unique opportunity to hear from both of us when calling in with their stock questions! Combining these disciplines can increase your portfolio profitability and stability. You won’t want to miss this special edition of MarketCall. Be sure to mark it in your calendar! Keith, you wrote “3135”. I wish! My guess is that the S&P spent so many times trying to break that all time high that it will stay above that level for awhile but won’t see any dramatic move up from that level. The only worries i have now are the put/call ratio and overbought market conditions suggest correction is likely–we could see a pullback to something below the 2100-ish level or below.